Marines in Marjah witness "extreme special ops measure"
You are at:Home»Afghanistan»Marines in Marjah witness "extreme special ops measure"
Stargazers all over Afghanistan went to bed late as they stayed up to see a lunar eclipse. Photo by Master Sgt. Michael O'Connor. Marjah, Afghanistan – It started with two bursts of gunfire outside the Hesco walls of the patrol base, a small square in the center of town at the governor’s compound. Within moments, the 3rd Platoon Marines of Bravo Company, 1st Battalion, 23rd Marines, were mustered by their vehicles wearing the required uniform: shoes, pants and weapon. It was about midnight. After a quick head count, and a determination that the gunfire had come from unknown activity between Afghan police, the Marines were told by platoon sergeant Staff Sgt. Chad Cada they could stand down and resume their sleep. But something had changed since the early evening and many turned an eye toward the heavens. 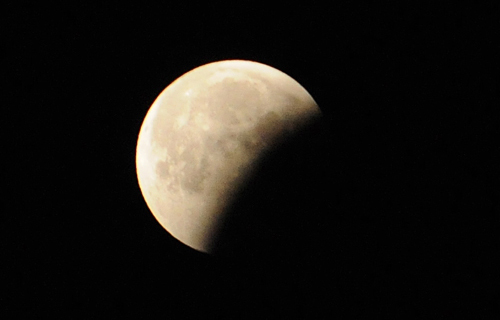 Though the moon had been nearly full in recent days, it was now partially covered by a dark, crescent-shaped shadow. No one had seen a lunar eclipse before, nor was anyone aware it was supposed to happen, but there it was, as clear as the day is long. The stars in the newly darkened sky were like a spray of hot, sparkling diamonds and great swaths of gauzy white constellations floated from one end of the sky to the other. Some of the Marines stood in the dark, watching the eclipse progress to completely cover the moon. The next morning it was learned that the shots fired had been celebratory gunfire at the unusual crescent moon. Cpl. William strong had a theory of his own. “The United States turned off the moon so some SEAL team could do a special mission,” he said. My boy friend is a Cpl. In Bravo Co. 1/23, I’m so proud of him and glad to see a good little story about the guys! Please keep up with these guys for us! They are truly a blessed group of Marines! I was so excited to see this article about the 1/23! As I read to the end, there my son, Cpl. William Strong was quoted!!!! Thanks so much! My brother is always the one with a sense of humor! Thanks for the story! Marines ask: Why not more Presidential Unit Citations?